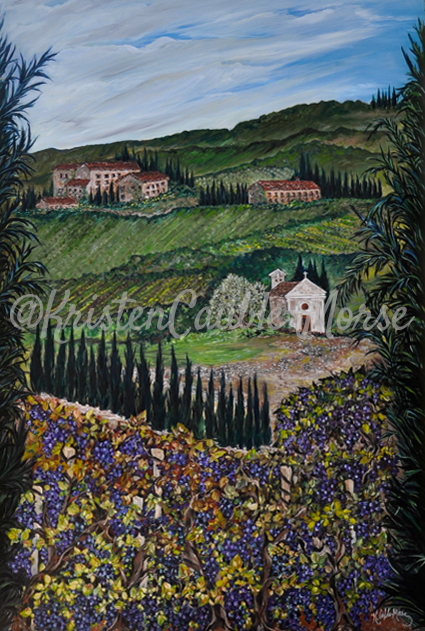 Toscano Italia, inspiration came as I drove through the rolling hills of Chianti that fall between Florence, Arezzo, and Siena. They are famous for their wine.. In 1716 the grand dukes of Tuscany extended the vineyards well beyond those hills, specifically for the cultivation of grapes.. I can only dream of living in a villa in Tuscany with gorgeous vineyards. In late September you can see miles of vineyard all ready for harvest season to begin with Olive Tree groves, and the ever-changing landscape rich in minerals. It’s breathtaking.